The Secondary School Aptitude Test (SSAT) and Independent School Entrance Examination (ISEE) are the two most common standardized aptitude tests used in American private secondary schools. If you're a parent or student looking to apply for admissions at a private, military, or boarding school, SSAT & ISEE For Dummies is your family's ticket to success. Here, you'll get all the prep needed to score higher on the SSAT and ISEE exams, the most up-to-date information on the tests, hundreds of practice questions, thorough test-specific math and verbal workouts, six full-length practice tests (all with detailed answer explanations), and solid test-taking advice. 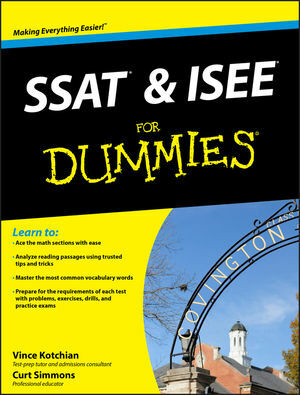 SSAT & ISEE For Dummies provides students with the resources they need for test day preparation and gives parents sound, expert advice on selecting, applying, and paying for private school. Vince Kotchian is an elite test-prep tutor and admissions consultant who has helped hundreds of students get into the schools of their choice. Curt Simmons is a professional educator and freelance writer who has authored several test-prep titles on a variety of topics, including many For Dummies titles.